You are here: Member pages » daniserralta » pictures » Lionesses hunting a warthog. Murchinson Falls N.P. , Uganda. 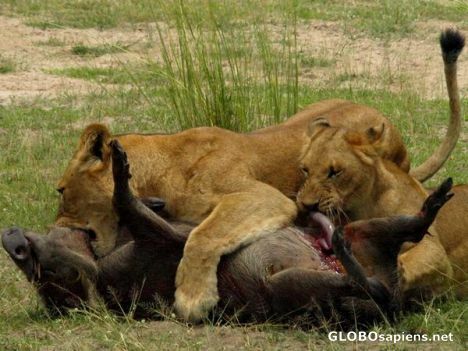 8 lionesses hunted a warthog and while it was still alive, but diying cause of the neck strugle, the other ones started to eat it by the stomach. I know this is just the circle of life, but this is a little unnerving. Wow, very difficult to look at but an incredible photo none the less. Must have been something to see this in person. How near were u?? Oh my.............this is so National Geographical and Animal Planet stuff! It gave me two kinds of emotions at least! Nevertheless brilliant!